Download swf file is very easy, and you do not even need any special tools to do so besides a good web browser. Executing swf save or download is almost as simple as downloading any other file or any other content that you see on any web site. 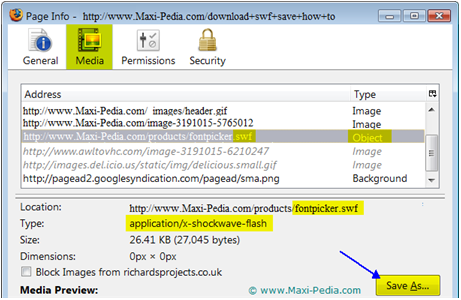 This article explains and demonstrates a simple method to download swf. Before we explain how to download swf, let's remind about one important principle of Internet. Remember that anything you see in your browser is after it has been downloaded into your computer. Letters, text, pictures, everything that you see on a page is located in your computer when you are reading it in your browser. The same applies to swf files. Internet works based on the client-server principle. The code that creates the content and layout of a web page sits at a server. When you type an address into the URL bar (for example: http://www.Maxi-Pedia.com) and hit enter or click the reload button, your browser issues a request that goes through the Internet to the web server. and displays it on your screen. It is probably obvious by now that most things are already downloaded to your Temporary Internet Files folder when you see them on the screen. The concept when you want to download swf is the same. If you want to know how to download swf without having to dig through your Temporary Internet Files folder, you will need one simple tool: Mozilla Firefox browser. This nice browser provides built in functionality to allow free download swf. 6. You will see a number of items in the menu. Your swf file that you want to download should be visible in the Address column (depending on the browser version). In any case, the file should say Object or Embed in the Type column. There might be more than one Object or Embed items in the menu, so you might do some guessing, or if you like, you can find the name of your swf file in the web page source code. Your swf save is done! In case you have any questions or feedback about any of these guides, feel free to let us know in our discussion forum.